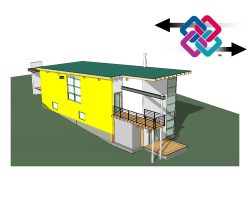 VisualARQ 2 - Flexible architectural BIM software for Rhino. VisualARQ adds architectural features and parametric architectural objects that are suitable for both 3D modeling and 2D documentation. Go through any architectural project design process with an intuitive, easy and efficient workflow. Curved walls, free-form surfaces, free-form beams... any complex architecture design is possible. Cut sections, make plans. No matter how complex your design is, you can save time getting all project documentation automatically from the 3D model. Floor plans, sections, elevations, surfaces, dimensions, and all object information are linked to and created from the 3D model. 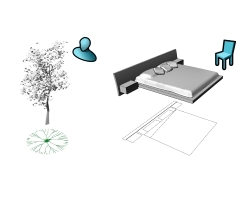 VisualARQ generates documents that combine drawing plans, the three dimensional model, and data tables, and all drawings are updated automatically after any change. You can even import your AutoCAD 2D files, or create them in Rhino. With VisualARQ you can convert lines in 3D walls, roofs, slabs, etc. with just a few clicks. Organise your project by levels, sections, layers, sheets, templates, and more through user friendly dialogs. 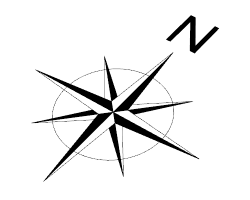 File format’s support, floating network licenses, external references and more. VisualARQ has a library set of parametric architectural objects: Walls, Beams, Columns, Windows, Doors, Slabs, Stairs and Roofs. Objects are easy to create, modify and edit at anytime, and automatic recalculation adjusts them to changes. 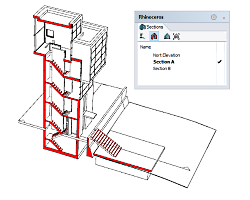 VisualARQ adds BIM (Building Information Modelling) features to Rhinoceros: geometry and object data are linked, and files are exported in .IFC file format. 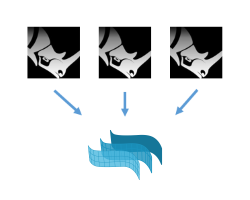 VisualARQ supports import and export from and to any file format supported by Rhino. VisualARQ material manager supports materials of all render engines that are supported by Rhino. Create lights and assign materials to objects, to get high quality images of interior and exterior architecture. 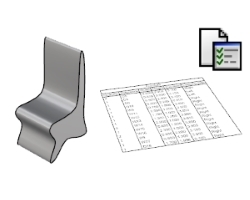 Just print the 3D model in Perspective, Section and Plan views for a real time 2D vector output. Create new parameters and add information to Rhino and VisualARQ objects so you can generate quantity takeoffs. Manage the sections in your model as you manage levels with the Level Manager. 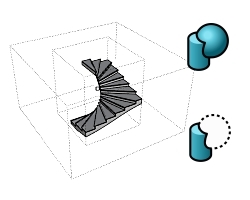 New objects to generate parametric custom objects with different representations in 2D and 3D. 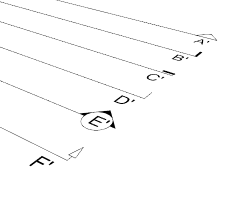 New 2D parametric element for symbols and annotations in 2D drawings. Do Boolean unions and differences between Rhino solids and any VisualARQ object without losing their parametric properties. 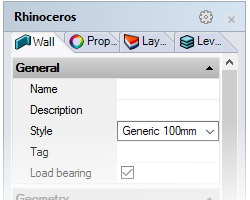 Materials, colours and layers are now imported and exported within IFC files. 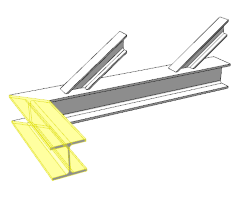 Beams calculate intersections and beam cuts can be defined at ends. 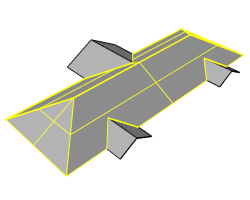 Roof interesections, roofs from surfaces, and multilayer roof styles. 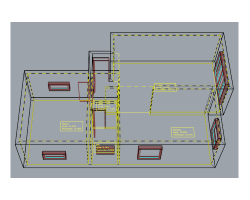 3D display, curtain walls are detected, option to add and remove elements for space calculations. 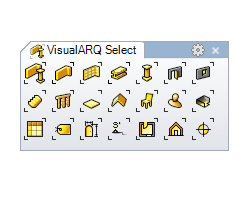 New commands to easily select VisualARQ objects of the same type. 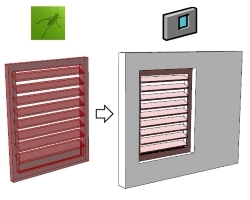 Fixed bugs related to VisualARQ support of objects in blocks and external references. Improved insert dialogs that can be docked for a better workflow. 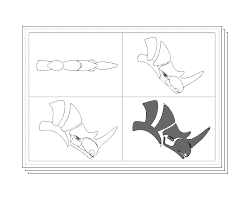 Symbols for tags and section arrows can be customised.